This article first appeared Jan. 19, 2017 on the Chronicle of Philanthropy website, http://philanthropy.com. It is reprinted here with their permission. What will new leaders at the local, state, and federal level mean for our mission? How do these new leaders and decision makers view our work? What changes might they contemplate that could affect us as an organization? While these questions provide an excellent starting point for conversation, the mistake that many board members and others will make is to assume that their next step should be to begin preparing themselves to accept whatever changes new leadership will bring. Our missions are far too important to sit on the sidelines while critical decisions are made. The people who depend on us need us to do more. They need us to engage. They need us to educate. They need us to organize. And, yes, sometimes they will need us to fight. They need us to advocate. For the past two and a half years, BoardSource has helped lead the Stand for Your Mission campaign, which has worked to educate nonprofit organizations — in particular, nonprofit board members — about the importance of their leadership as advocates and ambassadors for their missions. Now, in this moment, that’s exactly what we need from our board leaders. With a new balance of power at the federal level, a dramatic shift in the presidential policy agenda, and large-scale domestic spending cuts already promised, nonprofit leaders need to be prepared for potentially rapid and significant policy and funding changes at the federal, state and local levels. And we need to make sure that our voices are heard before those decisions are made. How much do you rely on government funds? What would happen to your organization if that support disappeared or contracted quickly? How big a risk is that, given the type of work you do or the type of support you receive? What policy changes might be proposed that would significantly threaten — or help advance — your organization’s work? Are newly elected leaders more or less open to the types of policy solutions that would help your organization expand its impact? What’s the big picture for the communities you serve? Are there proposals that could help — or harm — them? What will that mean in terms of the new realities that are created for those communities? How will it impact your ability to serve them and achieve the impact you seek? Articulate your values and beliefs. Now more than ever, nonprofit organizations need to have a deep understanding of their organizational values: what you are as an organization, what you care about, and why. This goes much deeper than defining your mission or advocacy agenda and is about the fundamental principles that guide your organization’s decision making. This is important because when the ground is shifting and changes in our external environment are moving quickly, there’s not always time to put together a formal strategy or to thoroughly discuss the pros and cons of a position or stance as a full board. In those moments, executives need to be able to rely on a shared understanding of organizational values and move forward with the confidence that they are acting in a way that is consistent with the organization’s, values, not just their own personal ones. Do we see our organization as a moral or ethical leader on any issue or set of issues? If so, what are they and how we would define our stance? If we asked those we serve what we stand for as an organization, what would we hope they would say? What decisions have we made as an organization that we would lift up as a good example of our organizational values? Why? Are there any decisions we’ve made that don’t reflect our values? Why don’t they? With what issues, views, or values would we be embarrassed to be associated? Are any of them things that we’d be willing to speak out against publicly? In what circumstance would we feel that was appropriate, or even necessary? Capitalize on existing relationships. Board members should tell the nonprofit executive how they could help the organization connect with a particular leader and work with the executive (or designated staff) to coordinate outreach efforts. Reaffirm support. Enlisting a board member to thank an elected official who has taken positions or made statements in support of things that your organization cares about can be a powerful way to let them know how much you appreciate their support. When it comes from a board member ­— particularly one they know or respect — it may carry even more weight than if it came from a staff member. Move past disagreement. Changes in the cast of players may create new opportunities to build a relationship with an incumbent with whom your organization hasn’t seen eye-to-eye. Consider tapping a board leader — ideally one who lives or works in that person’s district or geographic scope — to initiate a conversation. Educate new leaders about your organization and work. Don’t assume that newly elected leaders know about your nonprofit. Take the time to educate them about what you do, why it matters to your community, and why it should matter to them. 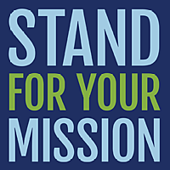 The Stand for Your Mission campaign has never been about partisanship or a particular political view, nor is it about advancing any policy agenda. It’s about a fundamental understanding of the role of nonprofits in society, what our work means to this country and the people we serve, and how all of that is affected by the decisions our elected officials make and the policies they enact. So as we enter this next chapter in our country’s leadership, let’s make sure that our elected officials know exactly who we are and what we stand for.